Comments Off on Just the Tip! Haven’t heard about the NEW they’re real! push-up liner yet? Where have you been, gorgeous!? Under a rock? Enjoying the pre-summer sun? Outside? FINE! We forgive you. But, you might want to start paying attention. Here’s what you’ve missed so far: the story about how this innovative product was 5 years in the making & this super easy summer eye look for every BBQ that comes your way. 1. It’s the FIRST EVER lash-hugging gel liner in a pen! 2. The waterproof matte black gel formula doesn’t smudge, budge or dry out. 3. The innovative AccuFlex™ tip make it BEYOND EASY to get close to your lash-line. All caught up? Let’s take a closer look at the tip, shall we? A completely new & ground-breaking innovation, the AccuFlex™ tip was designed with your liner needs in mind. Its soft and angled design makes it criminally easy to glide across the curve of your eyelid. Plus—and this is our favorite part—it makes drawing an even, purrrfect cat eye easy every time. Seriously. No more wonky wings! What else, you might ask? It’s lash-hugging! We created a flat, wide guard that gently pushes your lashes out of the way so you can get as close to the lash-line as possible! Finally, we’ve provided you with a wide base that provides maximum control & makes for more stable application. Think drawing with a pen is easy? So is this liner. The application method works very well indeed, and the scarily bright “Tango” orange is surprisingly wearable. 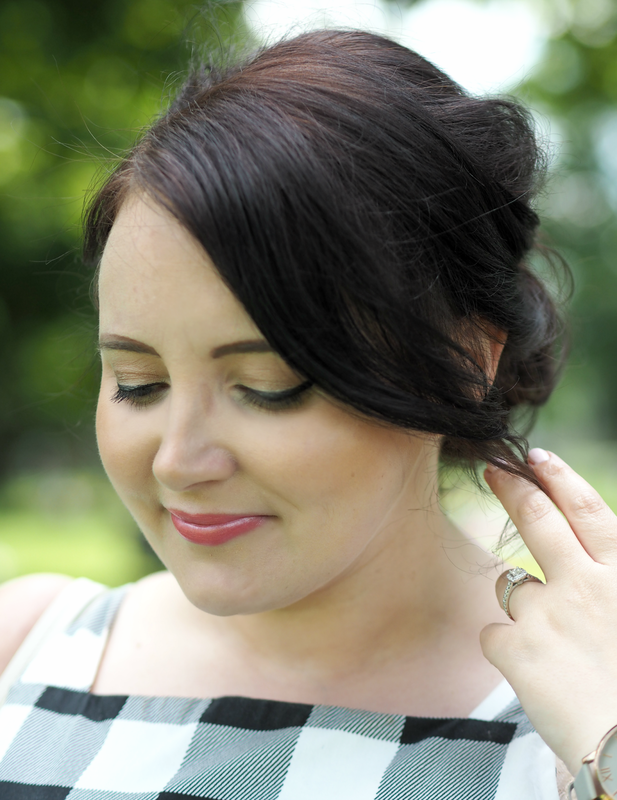 I haven’t really paired it with the best of makeup looks, because I was sat about trying out a load of different things at the time, but with simple, slightly-bronzed skin and a few coats of mascara the colour would really sing out. 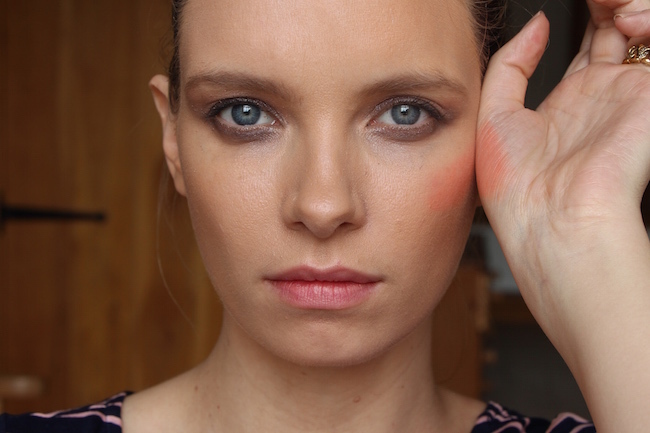 A word of warning (or five): this blush does not budge. Scrub it from your hands straight away and make sure that you blend it immediately upon application. 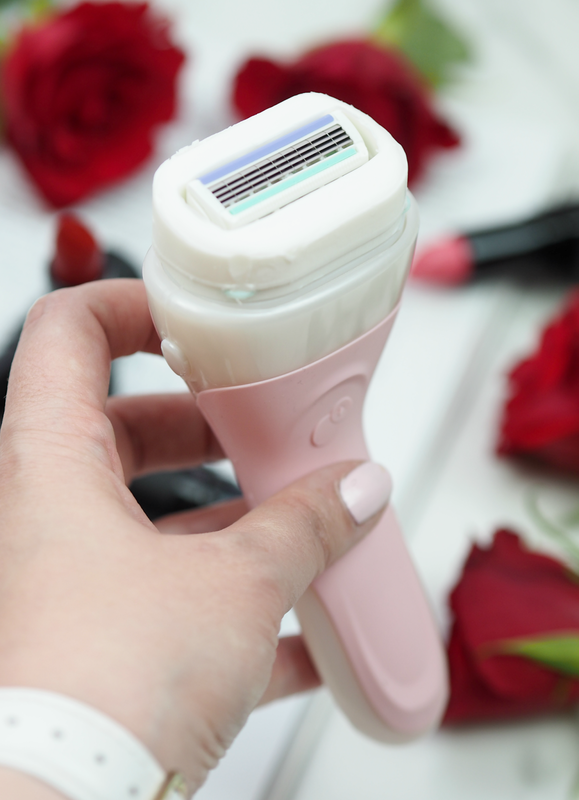 If you try to apply it straight from the stick then be ready with brush or fingertips to really buff it in, as it’s the quickest-drying formula I’ve ever used and once it’s on, it’s on for good! The texture is gorgeous – a cool, smooth gel – but it requires a little of your concentration to get things right. Let me know how you get on. There’s also a contour stick, same principle, but I haven’t tried that yet – I’ll keep you updated. 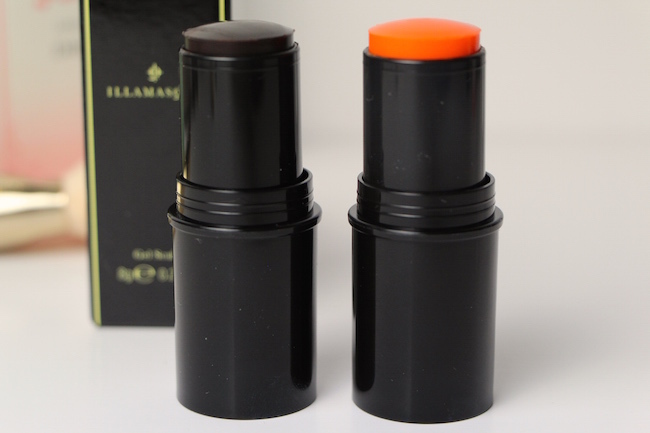 The post Illamasqua Gel Colour: Nearly-Neon Non-Moving Blush appeared first on A Model Recommends. Another month has come and gone. Here are some of my fave things from March! First of all, congrats on 25 years at Benefit! What made you want to be a beauty artist & why Benefit in the first place? Having the privilege to work with founders Jean & Jane Ford, I was able to learn a lot from the very beginning. The early days really taught me about how important it is to treat the customer & my co-workers with not only trust, but mutual respect. It may seem like a party from the outside, but customer service comes first! Any popular trends with your clients these days? I’m not kidding—every customer that sits in my chair wants full brows and long lashes. What are your favorite tips & tricks to avoid dry skin in the summer? Hydration is essential! Exfoliate with refined finish facial polish, follow with ultra radiance facial re-hydrating mist, then finish with total moisture. It’s also important to keep your face protected with dream screen, our new silky-matte broad spectrum SPF 45 sunscreen. Outside of skincare—opt for water instead of soda. Your body (& skin) will thank you later! Any summer beauty essentials you can’t live without? A hat & my favorite pair of sunglasses are a must. I also always keep an aloe vera plant in my kitchen—it’s perfect for sunburns. Just snip a stem, slice it down the middle & push with your thumb to release the gel. What are you favorite Benefit products? Total moisture, fakeup, they’re real!, gimme brow & the new hydrating tinted benebalm. Can’t live without them! Any special tips or tricks for getting the perfect wing with they’re real! push-up liner? For the perfect wing, I start by aligning the pen to the outer corner of your nose. With a light hand, dab a small line, then take your pen and fill in your wing. Repeat on the other side. The best part about this trick is that you get an even wing on both sides! Best or favorite makeup tip of all time? It may sound cliché but a little concealer & foundation go a long way. Add a little self-confidence, and you’re good to go! 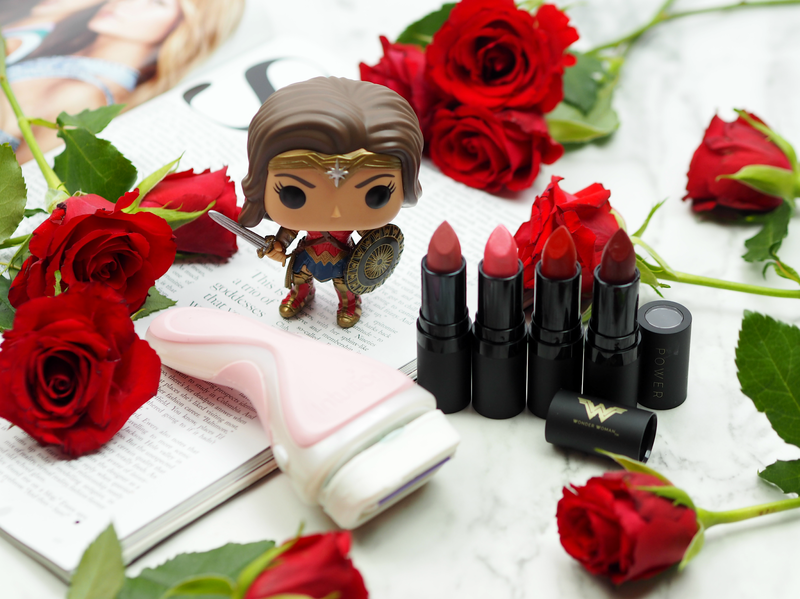 To celebrate the release of Wonder Woman this June, Wilkinson Sword has teamed up with the franchise to offer a range of limited edition lipsticks so that every one of us can channel our inner super hero (with or without the hotpants.) 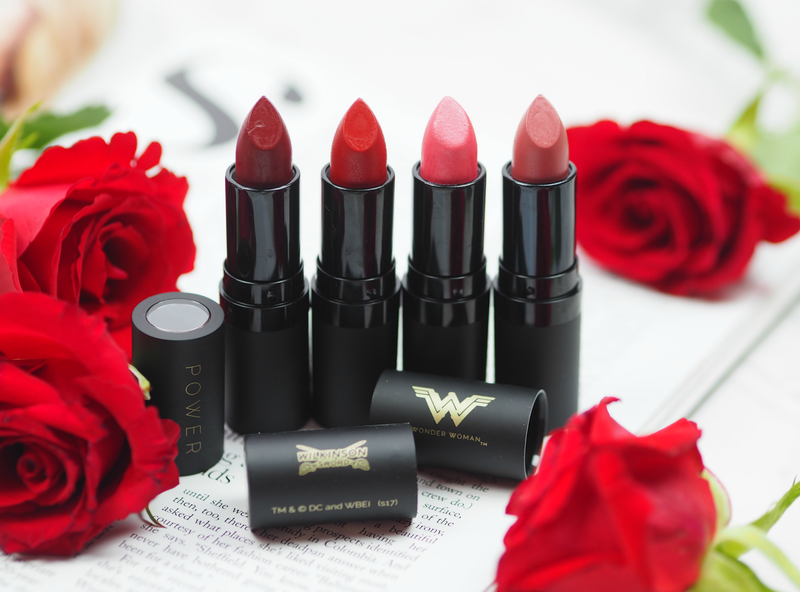 The four long-lasting lip colours are super nourishing and vitamin enriched (containing the highest amount of Shea Butter possible within a lipstick formulation,) providing a luxuriously soft and highly moisturising matte finish in super sleek black casing. 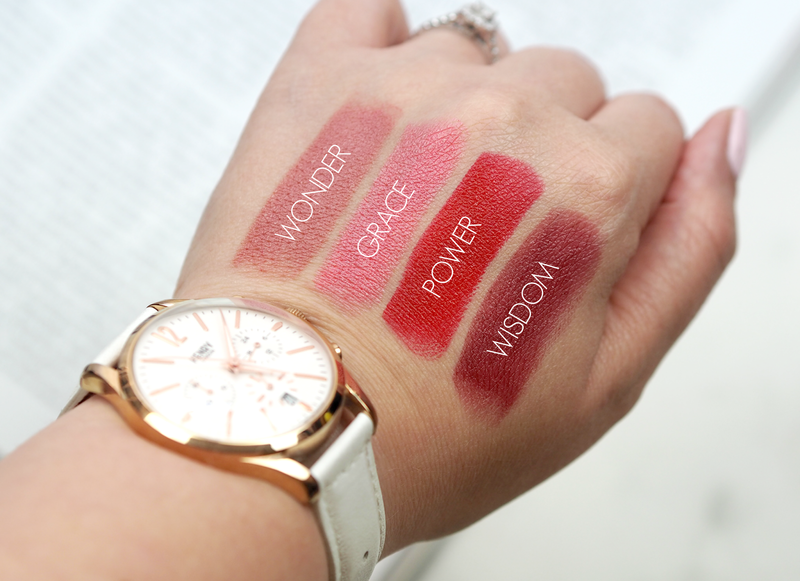 What’s great, is that the collection includes shades to suit every look and inner super hero: Wonder is a gorgeous pink-beige lipstick, Grace is a stunning soft coral, Power is a classic red that definitely shows the world who’s boss, while Wisdom is a deep merlot that works beautifully with every skin tone. 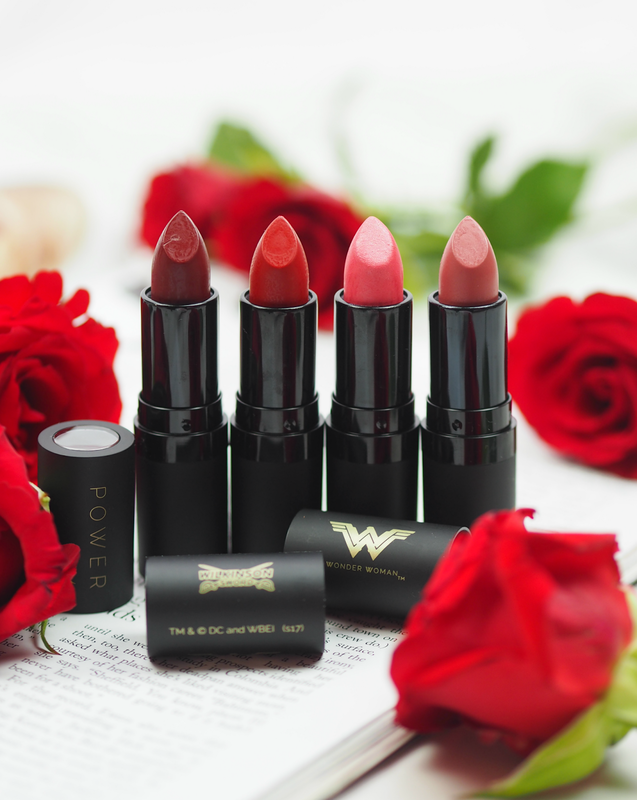 If you want to get your hands on one then they’re hitting shelves right now, and the limited-edition lipsticks are FREE with any purchase of a Wilkinson Sword system handle (whoop!) 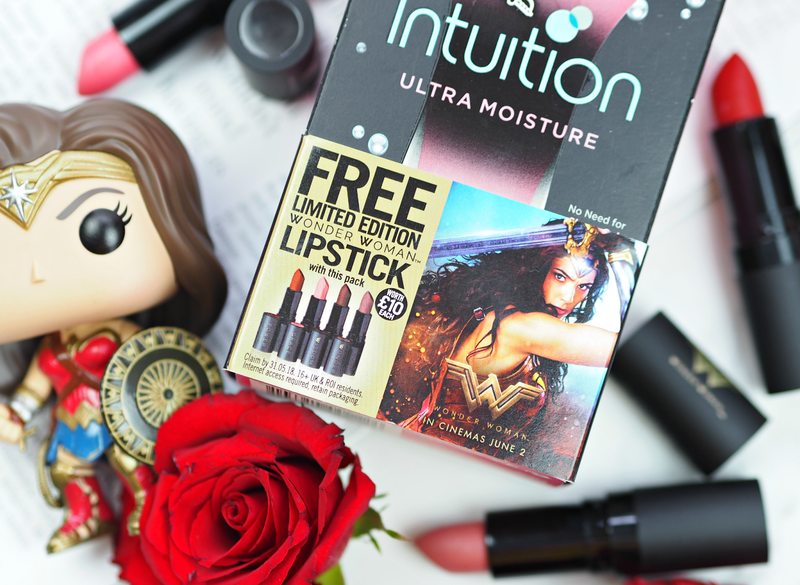 Yep, totes 100% free and worth £10.00 each – all you have to do is buy the specially marked packs and claim your chosen lipstick online using the unique code. 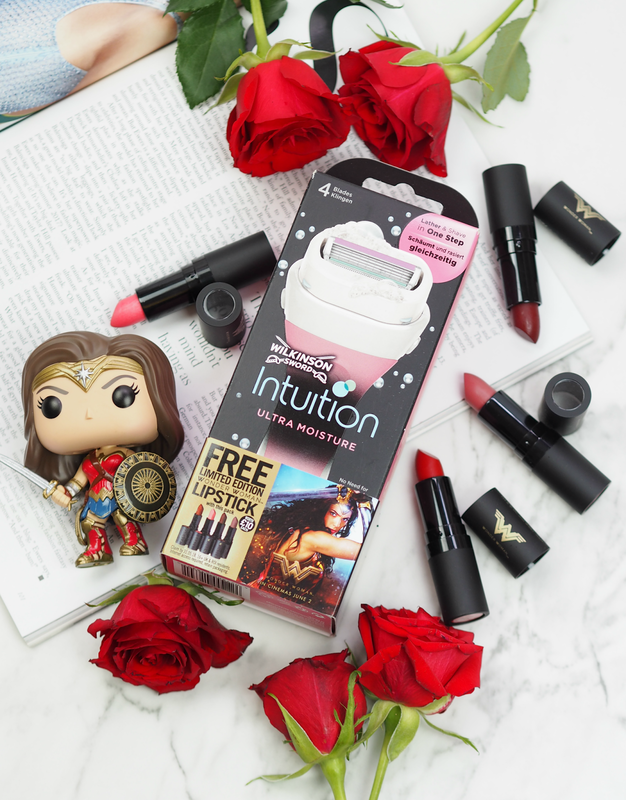 You can use your Wilkinson Sword Intuition to create super smooth and nourished legs (coz you know, hotpants) and then apply your lipstick shade to turn up the levels of sass to ‘ultimate sexpot.’ If you want to know a bit more about the razors themselves, my personal favourite is the Intuition which features a block of moisturising Shea Butter enriched shaving cream that lathers gently when used with water; choose from Ultra Moisture or Sensitive Care depending upon your skin’s needs (with all-new pro vitamin B5 plus Aloe and Vitamin E) to keep your pins in check and fuzz free all summer… Because when you’ve got shiz to do, we don’t have time to be faffing around with shaving foam and all that. 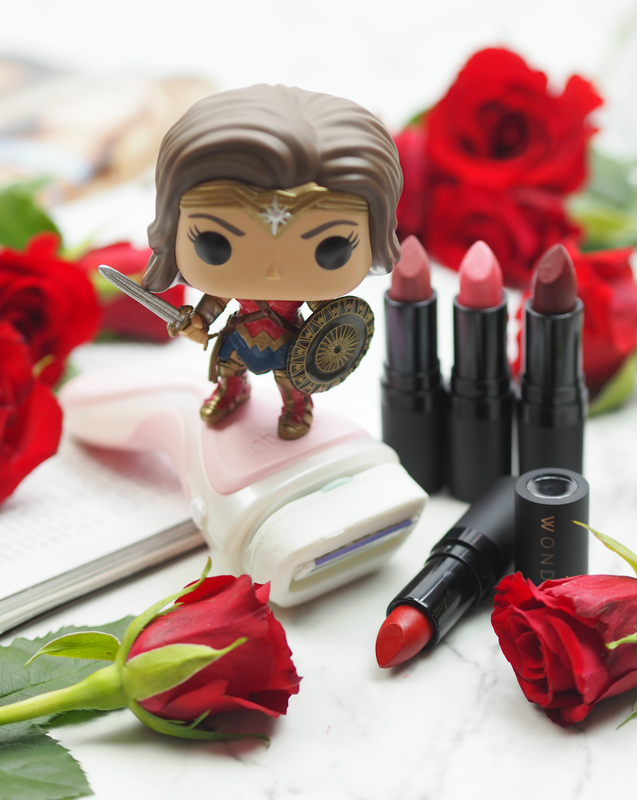 To celebrate the launch of the film, Wilkinson Sword asked me to create my own Wonder Woman look in my chosen shade… I’ve opted for the coral ‘Grace’ as it’s perfect for when the sun is shining, and a tone that looks good on every skin colour. 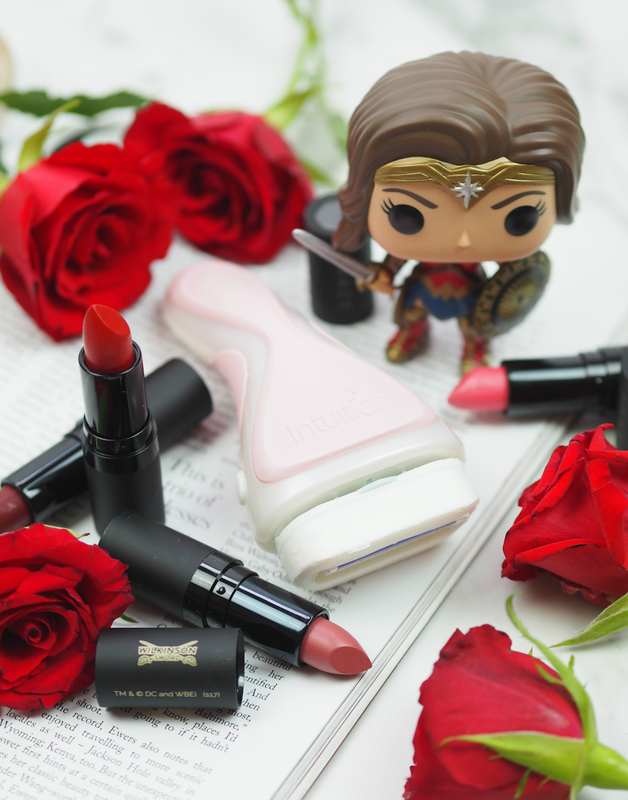 Combined with a touch of bronzer buffed into the skin, a tonne of highlighter on the tops of cheekbones to get that effortless ‘superhero’ glow, a powerful brow and a feline flick, it’s a look that says: “I’m effortlessly heroic, a bit of a babe and I don’t even need hotpants to be fabulous.” Team it with a tonne of volume in your hair (tiara optional) and a flash of something black, white, red or blue and you can strut down that street knowing you’re looking hawt. Will you be channeling your inner Wonder Woman this summer? Which shade would you choose? This is a sponsored feature in partnership with Wilkinson Sword; all opinions are my own.